Do you have problems being in large crowds? Do you ever get tongue-tied when talking to new people? Do you have a hard time making meaningful connections? Then, this is the book for you! Social Anxiety: Easy Daily Strategies for Overcoming Social Anxiety and Shyness, Build Successful Relationships, and Increase Happiness addresses the key points of social anxiety and shyness that inhibit you and keep you from realizing your full potential as a person.Inside, you’ll find:The evolutionary cause of social anxiety and shynessThe difference between social anxiety and shynessThe science and psychology behind social anxiety and shynessEasy daily methods to manage or stop your social anxiety or shynessIf the books, articles, and manuals you have read so far have not helped, this one can. 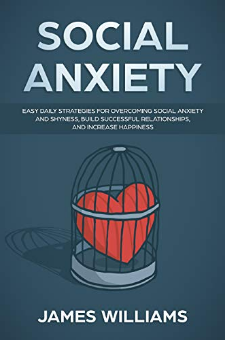 With tried and true, specific methods of conquering social anxiety, this book will help you understand where the shyness and anxiety come from and encourage you along as you wave goodbye to the uneasiness in your mind.Featuring the often-overlooked reason for anxiety and shyness, Social Anxiety: Easy Daily Strategies for Overcoming Social Anxiety and Shyness, Build Successful Relationships, and Increase Happiness explains why it is important to understand where your anxiety comes from and offers sound and psychiatrist-endorsed methods to free you from the feelings that hold you back from your best life.So, crack this one open today, and begin immediately practicing the tools inside to wipe out your shyness and social anxiety.